I think that I used to call them stuffed animals. Then I started working with Merchandise Outlet and dealing with our wholesalers and always referred to them as plush. Do you know what we would be talking about if we referred to "plush". Anyway - all of those mean the same... plush, stuffed animals, stuffies. Like many things at Merchandise Outlet, our supply chain of plush has changed. We used to get loads of plush in liquidation. That means that we would just buy a 3 foot square box and it would be full of stuffed animals. It could have been 2 stuffed animals that filled the entire box or 200 little pieces of plush. We paid the same for every box - something like $50. This would be the wholesaler cleaning out their warehouse, or packing up their merchandise show display of goods, something along those lines. We would get pallets of plush at a time. We haven't been able to get those very often anymore. Well we couldn't very well NOT have plush! We would still get a few items in with liquidation loads from different wholesalers. Or we would get a couple of pallets of our liquidation plush once about every 18 months. We usually ended up ordering particular plush items when we went on our buying trips. We would look for the most attractive plush or unique items at the best price. Of course, buying like this, we are a lot more restricted on how great of a deal we could have on plush. We always try to stay in our Merchandise Outlet "great deal" range of pricing - but still we are limited. Well imagine our excitement when we stumbled upon a load of liquidation plush in the last few weeks. Of course, this means that our quantities are limited. Although they are large quantities - these deals are going fast. We have 51" elephants. That is over 4 feet tall! They are beautifully plush - so cuddly! And they are $29.99. Where do you find a four foot tall stuffed animal for under $30? Besides Merchandise Outlet, of course! Do you see the dog laying on the shelf behind Morgan? Those are 39 inches. And those are $12.99! We have bears, dogs, safari animals, and more. These items that are cuddling with Morgan... $2.99! Can you believe it! Who doesn't love stuffies?! 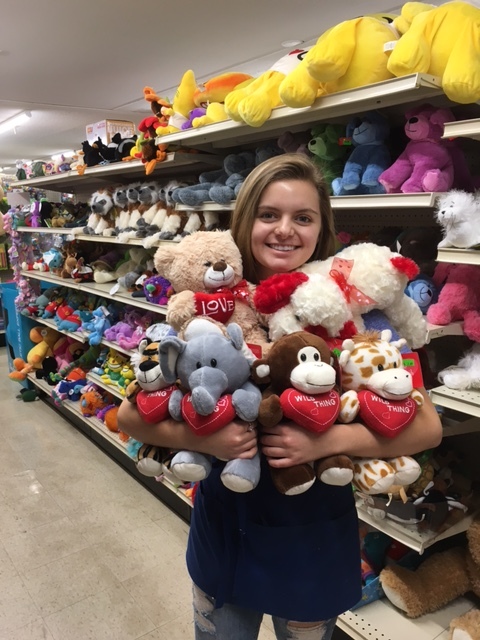 And who doesn't love a great deal on stuffies?!! !